Ballynahinch Olympic 3 2 1st Bangor Old Boys. 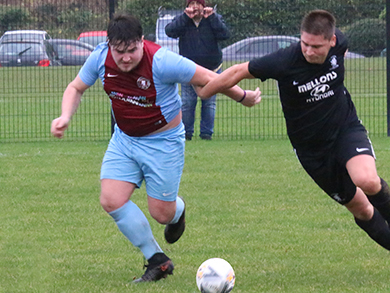 Ballynahinch Olympic entertained 1st Bangor and despite making a bright start found themselves behind after 9 minutes when the lively Bangor number 7 Ryan Oliver broke into the box and slipped the ball past the advancing Ryan Walsh in the Olympic nets. This did not deter the home side as they continued to press forward and worked a few openings but could not find the finish to match the good approach work. Callum Dougan used his strength and determination to carve out an opening but his shot failed to the visiting keeper. On 25 minutes Ballynahinch number 10 Molloy found McNamara with a great Crossfield ball into the right edge of the box. Just as he got his shot away he was closed down by the Bangor number 2 Murphy who deflected the goal bound shot for a corner. From the resulting corner Bangor cleared their lines and an early through ball saw Bangor number 9 Matthew Burrows race clear into the right edge of the box and as keeper Walsh advanced, Burrows chipped the ball over his head into the net to put Bangor 2-0 up slightly against the run of play. Olympic’s Callum Dougan in action with Jamie Marsh of the 1st Bangor Old Boys. A minute later Burrows had another opening from a similar position but put the ball narrowly wide of the keeper’s right hand post. However Ballynahinch were not to be undone and got themselves back in the game with a good period of pressure which eventually paid off on 34 minutes. Bangor’s Beattie was booked for a tackle on speedy winger Nathan Jones just outside the Bangor box on the Ballynahinch right wing. From the resulting free the visiting keeper failed to hold to the high ball and James McClean was quickest to react to nod the ball home and give Ballynahinch a way back into the game and just rewards for their never say die approach. Minutes later the Ballynahinch keeper had to be alert to keep out Oliver and saved with his feet while at the other end Ballynahinch could have been on level terms before the break as Nathan Jones, having switched wings, got clear but his shot from a narrow angle was well saved by the Bangor keeper to leave the half time score at 1-2 to the visitors. The second half started with Bangor on the offensive with Dalzell volleying wide on 46 minutes but Ballynahinch were not giving up and continued to press and from a quick break down the right wing Ryan Molloy crossed for substitute Murray who, on the stretch, prodded the ball narrowly wide on 50 minutes. On a rare attack Bangor Stuart Beattie fired in a long range shot which keeper Walsh had to tip over the bar on 62 minutes. Bangor took off Oliver who had been a constant attacking threat and sent on Marsh. Nathan Jones the Ballynahinch winger changed wings again and began making his mark on the game on the right wing by his decisive running at defenders which increasingly was causing havoc in the Bangor defence. Olympi’s Conor Reid challenges 1st Bangor’s Jordan Dalzell. The period of sustained pressure eventually paid off on 71 minutes when Jones raced into the box at speed and unleashed an unstoppable shot past the Bangor keeper to bring the sides level to setup a grandstand finish. Bangor replaced Murphy with Ferguson immediately in an attempt to deal with wing threat of Jones. 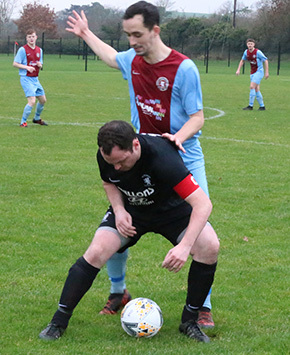 Ballynahinch were not settling for a draw and continued to press forward and on 82 minutes Bangor number 12 Marsh was red carded for a foul on Jones near the right edge of the Bangor box. The turnaround was complete from the resulting free when Olympic number 15 Chris McNamara got across his marker to glance his header past the Bangor keeper to give the home team a much deserved lead. On 86 minutes they had a chance to increase their lead but Molloy was narrowly wide when in a good position and on 88 minutes young Jones rifled a shot in from distance that clipped the top of the bar. Try as they might Bangor could not respond and with a final flurry number 9 Burrows was high and wide with a half chance just inside the Ballynahinch box. Ballynahinch deserved their win with Nathan Jones their star performer especially in the second half but were made to work for this result by a good Bangor side who were well served by Burrows and Oliver. Olympic have only played seven league games are are positioned well stalking the leaders. Subs: Adam McClean, Shane Murray for Dougan, Steven McGoran. Subs: Ryan Marsh for Oliver, John Jamison for Caldwell , Ally Ferguson for Murphy.